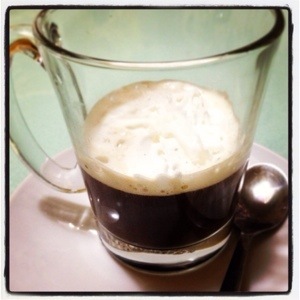 The Barista Wannabe : Vienna Coffee | Eating Aloud! Maybe I should just admit it. I don’t like black coffee. Nope, not even when it’s topped with whipped cream like this Vienna Coffee. I probably should have added more whipped cream. Anyway, Coffee with milk and sugar anytime! But I must say, this looks beautiful. Because I made it! Haha!